NOTE: This may or may not be the last Top 25 before the season. Depends how much I find out during August. Regardless, this will take a focus on what was learned (heard) during the spring/summer passing/linemen competition circuit. 1. Bishop Amat — Most athletic Lancers defense in some time. 2. Charter Oak — Pac-5 level talent in the skill spots. 3. La Mirada — Reloaded. Only concern is chemistry. 4. Glendora — Even with Fink, not impressive on passing circuit. 5. St. Francis — Word is Knights are down a notch. 6. West Covina — Promising better pass attack. 7. La Habra — Offensive skill talent is scary. 8. La Serna — LB Campos looks like special talent. 9. San Marino — No real word on if defense is better. 10. Monrovia — Line play looking real strong. 11. Northview — Word is line play is down from ’14. 12. Damien — Word is there’s minor improvement in talent. 13. Los Altos — Weight room numbers are scary. 14. Muir — QB and line concerns remain. 15. Bonita — About the same as last year. 16. South Hills — Guessing game in several key spots. 17. San Dimas — My, how soon we forget. 18. Diamond Ranch — Talent lacking in key spots, I’m told. 19. El Rancho — Not getting much info on this team. 20. La Salle — Talent level didn’t drop too but it’s young. 21. St. Paul — Mystery team due to skill talent questions. 22. Montebello — Defense and running game still look good. 23. El Monte — Two very legit skill players at QB and RB. 24. Arroyo — Strong line play. Like really strong. 25. Rosemead — Word is Panthers way down along both lines. After Los Altos made a huge run to the Central Division championship game last season, it was easy to look at the roster and conclude the Conquerors will fall off this season (and maybe beyond) because of all the talent lost to graduation. That’s probably not going to happen. Los Altos’ junior class went 10-0 as freshman and allowed 18 points all season. That group includes running back Tyler Nevens, who freaked as a sophomore last season by rushing for 1,683 yards and 15 touchdowns. — Eight players who can squat over 400 lbs. — One player who can squat over 500 lbs. — Of the two players who can squat over 400 lbs., one of them is Nevens and the other is receiver Art Vargas. Five are O-line starters. — QB Michael Campbell (a rare senior on the roster) is thought to be the best QB since head coach Dale Ziola has been there. — Current junior is technically (weight room) stronger than last year’s senior class as seniors, which was technically the strongest class in school history. Yes, stronger in the weight room (numbers-wise) than the Cody and Harwell teams. As many of you know, Bishop Amat has arguably the best tailgating scene in SoCal high school football. … make that HAD arguably the best tailgating scene in SoCal high school football. Obviously, this is a big blow to the Amat football experience. Fans were notorious for showing up hours before kickoff and getting the weekend party started right. I don’t know how Freddie’s gonna take this. It’s USC for Bishop Amat’s Trevon Sidney! 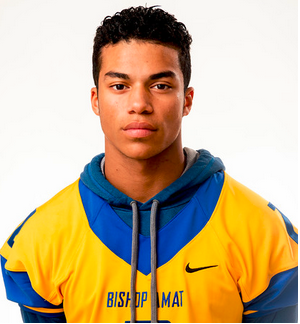 Bishop Amat High School football standout Trevon Sidney won’t stray too far from home to play his college ball. Sidney, a highly coveted receiver and defensive back, picked USC on Friday evening over a who’s who list of college football powerhouses. His verbal commitment was made at “The Opening” football showcase put on by Nike in Oregon. “The coaching staff is just a great coaching staff,” Sidney said when asked why he chose USC. “Whenever I go there I just feel better and better about the school. When I’m there, I feel most at home. Sidney had narrowed his decision to UCLA, Washington, Michigan, Notre Dame and USC. Playing close to family and friends also was a key factor for Sidney, who lives in Covina. Sidney set out this offseason to improve his stock at receiver. He was already considered one of the top corner back recruits in the country, but prefers to play on offense, which is something USC will allow him to do. Sidney also said the USC coaching staff was open to him playing both ways. In 2013, Sidney was the Tribune’s Newcomer of the Year after intercepting eight passes in his sophomore season at Amat. Last season, Sidney was an All-Area performer at defensive back and was also the Lancers’ third-leading receiver. The offseason combine circuit really helped boost Sidney’s exposure as a receiver. He was named wide receiver MVP at the Passing Downs Tournament in March and the Rivals 100 5-Star Camp in Baltimore, Maryland in May. Sidney joins Glendora quarterback Matt Fink in becoming a local USC commit. Next up could be Sidney’s Bishop Amat teammate receiver Tyler Vaughns. Muir High School will host a camp for defensive backs on Saturday morning at 9 a.m. The camp will be run by former Mustangs greats Marcus Robertson, Tony Crutchfield and Dwayne Walker. THE CAMP IS FOR HS JUNIORS, SENIORS AND JUCO LEVEL PLAYERS. THE COST IS FREE.